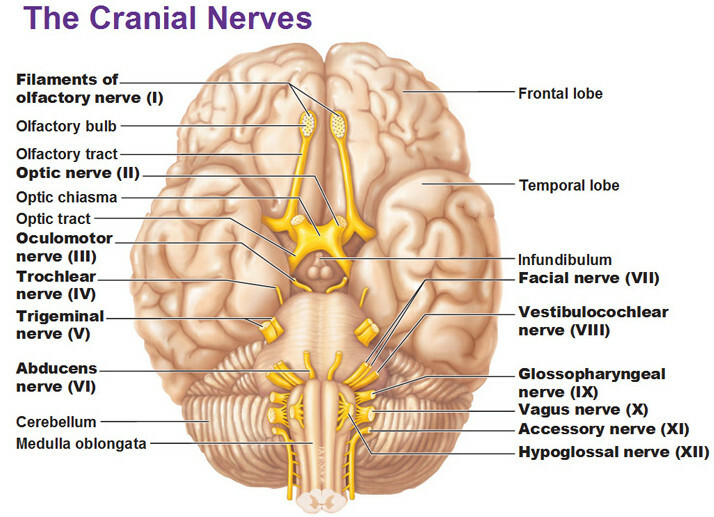 The tenth cranial nerve, and one of the most important, is the vagus nerve. All twelve of the cranial nerves, the vagus nerve included, emerge from or enter the skull (the cranium), as opposed to the spinal nerves which emerge from the vertebral column. The vagus nerve originates in the medulla oblongata, a part of the brain stem. The vagus nerve is a remarkable nerve that relates to the function of numerous structures in the body. The vagus nerve supplies nerve fibers to the pharynx (throat), larynx (voice box), trachea (windpipe), lungs, heart, esophagus and most of the intestinal tract (as far as the transverse portion of the colon). And the vagus nerve brings sensory information back from the ear, tongue, pharynx and larynx. The term "vagus" (Latin for "wandering") is apt because the vagus nerve wanders all the way down from the brainstem to the colon, a long wandering trek. Complete interruption of the vagus nerve causes a characteristic syndrome. The back part of the palate (the soft palate) droops on that side. The capacity to gag (the gag reflex) is also lost on that side. The voice is hoarse and nasal. The vocal cord on the affected side is immobile. The result is dysphagia and dysphonia (trouble swallowing and trouble speaking). One of the best known branches of the vagus nerve is the recurrent laryngeal nerve. After leaving the vagus nerve, the recurrent laryngeal nerve goes down into the chest and then loops back up to supply the larynx (the voice box). Damage to the recurrent laryngeal nerve can result from diseases inside the chest (intrathoracic diseases) such as a tumor or an aneurysm (ballooning) of the arch of the aorta or of the left atrium of the heart. The consequence is laryngeal palsy, paralysis of the larynx (the voice box), on the affected side. Laryngeal palsy can also be caused by damage to the vagus nerve before it gives off the recurrent laryngeal nerve.